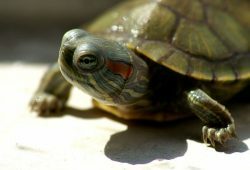 Home » Pet Turtle » Are Pet Turtles the Right Choice for You? Are Pet Turtles the Right Choice for You? 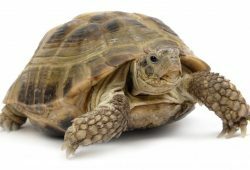 The article concerns the following question – Are Pet Turtles the Right Choice for You? Turtles live very long, however, you need to know how to look after turtles the right way so they can live a happy life. So are pet turtles the right choice for you? Let’s find out. 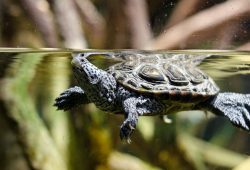 You may have heard about pet terrapins, tortoises and turtles. Terrapins generally thrive on land but require water to occasionally dip in. They are both carnivorous and vegetarian, which means they may either consume small fish or weeds/algae. On the other hand, tortoises are entirely vegetarian . They tend to hibernate all throughout winter and live well as garden pets and are well suited to houses rather than smaller living spaces such as apartments. Turtles are predominantly found in the sea. They consume both fish and vegetables. The only time they go on land is when they are laying eggs. Turtles are not suited to being pets, however, the term “turtle” is commonly used to generally describe both terrapins and tortoises. Now let’s talk about caring for a pet turtle in general. A turtle guide will give you an idea whether having one is the right choice for you. As opposed to common belief, pet turtles require lots of care and commitment. The way you care for a pet turtle will depend on its specific needs—find out what kind of environment and diet it is well suited to (refer above). Additionally, you need to know if you can actually have a pet turtle: it is illegal in some states. An aquarium is usually recommended as long as it is big enough. It is advised to get a 29 gallon tank or bigger. If you’re going to get a pet turtle that needs both dry land and water to swim in, you need to make sure it has enough room. Large rocks can be used as dry land for your turtle. The water should not be lower than the turtle’s shell. For pet turtles that swim a lot, you can raise the water level a bit. You may provide a submersible heater to maintain temperature. 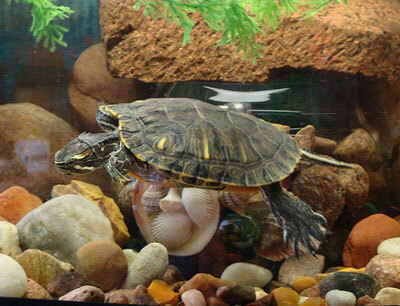 It is recommended that you clean the turtle’s tank every few days. A filter can help. Many turtles like to bask, so provide a source of lighting over the aquarium. A 25-40 watt reptile basking light is permissible. It is recommended to leave the light on only at night when temperatures drop. When feeding , you are not to do so too little or too much. Feed young pet turtles only about twice a day. Vegetarian turtles usually enjoy bananas, tomatoes, apples and lettuce leaves. If the turtle is carnivorous, you may feed it fish, crickets and earthworms. Always ask about the turtle’s recommended diet before buying one. Most turtles require a good source of calcium and vitamin D for a healthy shell. Aside from knowing how to look after turtles, you need to know hot to prevent Salmonella infections. If you have kids, it is important to teach them how to handle turtles properly so they don’t contract Salmonella. Either prevent them from handling a turtle or make sure they wash their hands immediately after handling. Refer to a pet turtle guide to learn more about turtle care. Now that you know a bit about pet turtles and how to look after turtles, you can now decide whether to buy one or not.